The month of April is Black Cat Appreciation Month. 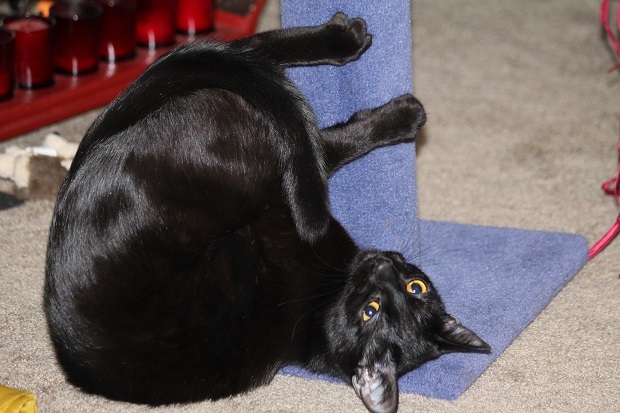 So stand by for pictures and posts about my black cat, Norie. My article on my cat Norie as published on Candid Slice.http://www.candidslice.com/little-panthers-five-insights-into-your-cats-wild-side/. After all we pantherettes are solitary intelligent animals. Although, when shown the luxuries of living with a human, some of us choose to live with them. I wouldn’t be so smart if I turned down free food, litter boxes, and companionship, would I? One of my “wild” black cat activities I like to do, is to go out to the indoor jungle my human calls “the garage.” Communicating my desire to go there is best done by sitting patiently at the little moving wall to the indoor jungle and staring at it’s handle. If Human is nearby, she opens the little moving wall and let’s me out. Thankfully she leaves the little moving wall cracked so I can come back in when I want to. Why do I like the “indoor jungle?” Well, for one thing, since I am a little panther, I love to hunt. I occasionally find a lizard or a bug and get to play with it before I am discovered by my human. I also like sitting on her go machine. I can survey the whole place from on top of it and leave my tracks on her see through place on the front of it as I slide down it, especially if it is wet! I like to sit there at night and remember my panther origins or contemplate my life, lizards and the pursuit of my happiness. There are box mountains to be climbed over and explored. There are always interesting smells when her go machine comes back. I have even been known to take a leisurely feline nap. When she finished, she closed the little moving wall and I couldn’t get back in. Generally if she is in the house and doesn’t see me around, she checks to be sure I am not locked in somewhere and comes to my rescue before I starve or need the litter box. Much to my surprise, my friend, Sister, came and scratched on the moving wall (because my human didn’t hear me scratching) and called Human to rescue me. Humans don’t realize how scarey it can be walking around on the floor in my domain. People trip over me, step on my tail, or back over me. I even lost some of my tail fur when Human rolled over me in her rolling chair! And everything is higher up than I am. If I want to see something I have to jump to a higher place. Your Norie sounds a lot like my Tennyson was. When we moved him and his brother to CO, we felt so bad for putting them through the stress of the move we bought them an indoor jungle tree to climb on. They used to fight over who hot to be on the top shelf! Got great pictures of the two of them. They are a delight. I did buy a short tree with three levels on it. I need to add a picture of that! Found a new “entertainment” that one of the cats like. I take 3 cat treats, stick it in an empty toilet paper roll, crimp the ends shut and fold them over, then toss it on the floor. Great fun figuring out how to get to the treats. What a great idea!! I bet Norie will love it! Rose, Norie was fascinated for a while. Got one treat out then stopped playing with it. I changed the crimping a little and she is at it again. What a great idea!! Thank you! So pleased that you enjoyed it!! More cat posts will be coming out each Thursday. So sweet. Your cats are so lucky to have you as their mom. So many are left outside with no human contact and no love around. I am afraid they are quite spoiled but I do love them. Thanks!! Nicely done. Norie does seems to have resisted attempts at full domestication. Norie reminds me of a panther I once served, Prince Soot. 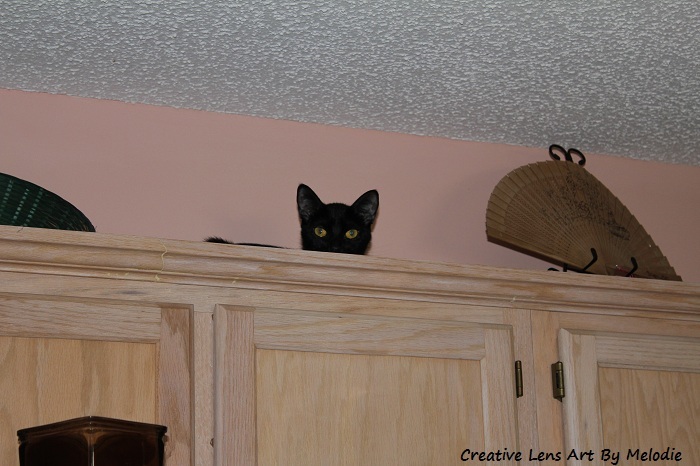 Norie’s perch on the top of the cabinets reminiscent of when I brought Satchel the Wonder Dog home from the shelter and Prince Soot spent two weeks perched on top of the cabinets thoroughly furious at the addition to the household. They became best companions over the years and grew old together, passing within days of each other. A lovely photo essay of your beloved Norie. Thank you. Good that they became friends. Delightful story too. Thank you! !